In connection with the Bhagavad Gita’s 5151st birthday, a record setting event took place at the Tanah Lot Temple in Bali. 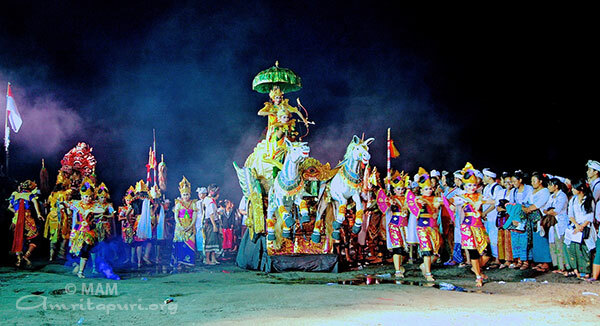 Over 8,000 Balinese youths gathered to chant the Gita in its entirety. The youths remained seated for the full 3 hours it took to chant all 18 chapters of the sacred scripture, vowing not to get up until finished. After the chanting was completed, a number of dances and performances related to Krishna and Arjuna’s interactions in the epic story were held . The kind, innocent, nature of the Balinese, their resolute faith and devotion, as well as their preservation of their culture, was beyond remarkable. Swami Purnamritananda Puri was a guest of honour. Swami was accompanied by Agus Indra Udayana (spiritualist and humanitarian, founder of Ashram Gandhi Puri), Eka Wiryastuti (Governor, Recency of Tabanan, Bali), Dr. Arya Wedakarna (local political activist and youth leader, grandson of Indonesia’s first President), a number of scholars, Sannyasis, and many others.